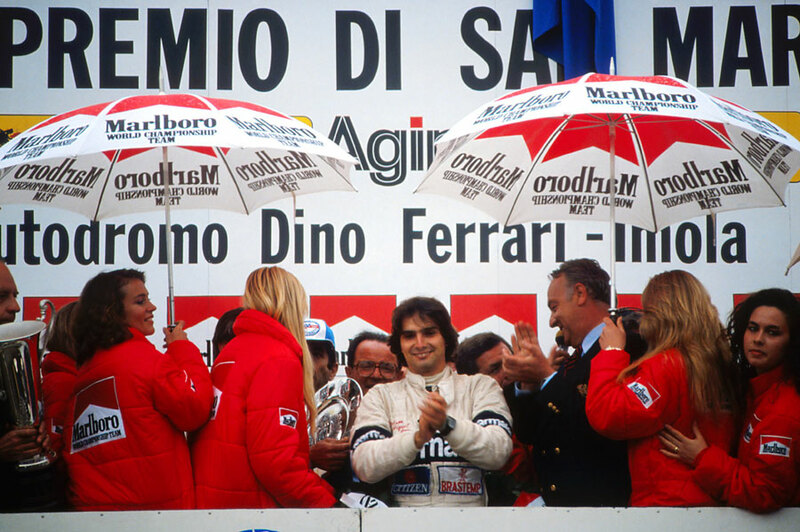 Nelson Piquet scored his second successive win with victory at the San Marino Grand Prix, taking him within three points of championship leader Carlos Reutemann. As was becoming tediously familiar, the build-up to the race was blighted by the ongoing power struggle between the FIA and its figurehead, the autocratic Jean-Marie Balestre, and the Formula One Constructors' Association, led by Bernie Ecclestone. Rumours again circulated that the race could be scrapped, before the two sides agreed a temporary truce at the start of the weekend. The grand prix started in damp conditions and the early stages were dominated by the Ferraris of Gilles Villeneuve and Didier Pironi. But the car's unreliability and a belief among other teams that its tyres would pose problems led them to play a waiting game. It proved a sound move. Villeneuve ceded the lead on the 14th lap when he had to change his tyres, and Pironi was overhauled as his car struggled with overheating problems near the end of the race. He did well to hold on to take fifth, with Villeneuve just out of the points in seventh. Behind them, Piquet was best positioned to capitalise after Alan Jones, who had started eighth on the grid after a wretched time in practice, damaged his nose cone trying to pass his team-mate at the start, and Reutemann then struggled with tyre vibrations. Once ahead the Brabham was unstoppable and Piquet came home five seconds clear of the Arrows of Riccardo Patrese who drove well, drama-free, to take advantage of the problems of others. Third was Reutemann from the Brabham of Hector Rebaque while Jones struggled home two laps down. As had happened in Argentina, the weekend ended with protests about various cars as several teams had made rushed changes to try to close the gap on the Brabhams. It was clear that nobody knew what was and was not allowed and the procrastination by the FIA in issuing clear guidelines only added to the mess. For the first time in 11 years Lotus missed a grand prix. All the team's efforts had been put into the new Lotus 88 and when it was banned by the FIA it left it without a credible option and Colin Chapman decided to stay away rather than enter the old Lotus 81.